I know I have to replace the struts/shocks on my 79' TA with low miles. Not sure I need to spend the $ for spring as well. It's a weekend cruiser. 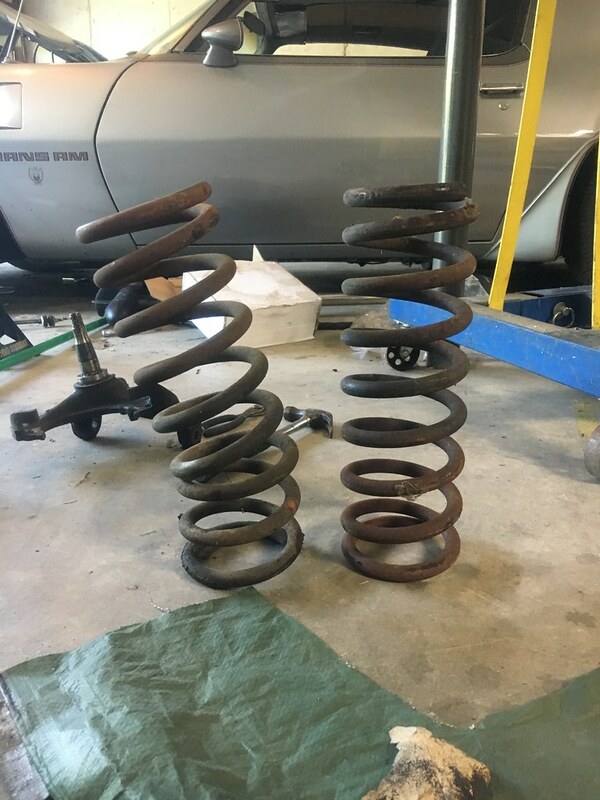 How many of you are still riding the original springs (front/back)? I think the majority are still using the originals. I've replaced the perches and re-arched the rear leaf springs only. Ha.... Funny you say that. I just got done replacing control arms and springs this weekend and this is what came out. I would recommend swapping springs since they are so old and should be worn regardless. This is from a car with less than 60k miles. If you're going to keep the car awhile I'd replace them all, and lowering it a bit - as most likely your original springs have "naturally" lowered your ride height. I still have my originals, cut the fronts to level it out. I do have Bilstien shocks so it handles like a controlled marshmallow. Recently replaced my originals with PTFB 1LE kit, what a difference. old ones looked better in car than out. What springs did you replace with? I'll most likely go with Bilstien for struts/shocks. I think I still have the original springs in my 71 Firebird. The suspension is all over the place and handles like a wet noodle. Mainly because Most of the suspension is very old . Just got all the replacement stuff recently and just waiting to install it! The picture shows that the factory springs are too soft and too long, you can compress a spring of any rate to support any weight but a soft spring has to compress much more to support that weight so it can actually cause the steel to be flexed past it's elastic point and it will take a set as you see in the picture. I went with the PTFB GT kit - springs, swaybars, subframe connectors, solid body bushings. Shocks are Bilsteins in front, Viking double adjustable shocks on the rear. Handles like a sports car should now vs the uncontrollable boat it was on the old worn out suspension. The Bilsteins are fine, but the adjustables are a great way to ensure you get the ride comfort/handling you're looking for. However I've found that once I found a good setting, I never adjust them again. "The Bilsteins are fine, but the adjustables are a great way to ensure you get the ride comfort/handling you're looking for. However I've found that once I found a good setting, I never adjust them again." The nice thing about Viking shocks is that with 19 positions of adjustment and at $160-$180 you only buy shocks once even if you make changes or you find that you want to go to the track. as an example Bilsteins or any other quality shock can set you back $75-$130 with no adjustment and if you pick a shock with the wrong valving you are either stuck with it or buy another shock, same if make changes. Buying another set of shocks puts you at the same cost as a set of Viking shocks. LOL. Yeah I'm trying to get my money's worth out of the fronts...when the day comes I'll match them up with the rears. If I remember correctly I went adjustable in the rear as I felt I needed a bit more control than the Bilstein's provided. Agree with your point that there's risk in one not being happy with a shock only offering one setting. If I were to buy shocks in the future I think I'd always go with an adjustable option just to be safe. wish it was easier to replace front springs as i would do it on almost every f body i get at the shop as most still have original springs up front. most ta's sit to high in the front. i got 2" lowering springs from firebird central and anxious to get them on my 78 while its at paint shop. my other 78 ta has original front springs and one side sits about an inch higher than the other, hate it. Original rear leafs, I think the car has around 85k miles but has sat since 2001 or so. Front springs were a bit worn out. The rear leafs in my 75 were replaced 2 times due to breaking. The front coils we're original when I tore the car down. Those coils we're so saggy I could not fit a floor jack under the frame at the cross bar under the oil pan.